Axis Eastern Front allies: Spanish ‘Blue’ division, Croatian Army, pro-Axis Serbian troops. Spanish soldiers of the Blue Division on the Eastern Front. In return for German help in the Spanish Civil War, Franco agreed to the formation of a Spanish Volunteer Division of 18,000 men, most of whom were regular soldiers, to participate in the ‘crusade’ against Bolshevism on the Eastern Front. On 25 July 1941 the Spanish ‘Blue’ (Azul) Division became the 250th Infantry Division of the German Army. The usual four infantry regiments in a Spanish division were reduced to three (262nd, 263rd, and 269th) with the 250th Artillery Battalion and divisional units. Personnel strength was 641 officers, 2,272 non-commissioned officers and 15,780 men. After sustaining 12,776 casualties, the Division was withdrawn from the front in October 1943. From November 1943 a Spanish ‘Blue’ Legion with two infantry banderas (battalions) and a mixed bandera with artillery, anti-tank and combined companies was engaged in fighting partisans in the northern sector of the Eastern Front. Following the general retreat into Estonia the Legion began to leave for Spain in April 1944. Five Spanish Air Force squadrons, trained and equipped by the Germans served with Army Group Centre. Only one squadron at a time served at the front. The squadrons served mainly as bomber escorts and accounted for 156 Soviet aircraft on the Eastern Front. Captain of the German Army’s Croat Legion. Most Croats wore German uniforms with Croatian field caps and badges, but this officer’s tunic may also be Croat Army issue. Even before the German victory over Yugoslavia was complete, the country was already in the process of dismemberment and on 10 April 1941 the Independent State of Croatia was proclaimed. The new Croat State began raising its own armed forces by conscription. This new army was known as the Hrvatsko Domobranstvo (which literally means Home Army), and by the end of 1941 it comprised four army corps, six divisions and 46 battalions. Two types of Croat formation came into existence; these were the rifle brigades (Jagerbrigaden) and the mountain rifle brigades (Gebirgsjagerbrigaden). The mountain rifle brigades were composed of two rifle regiments and two battalions of artillery. In 1944 the personnel strength of the four rifle brigades was 35,000 men. 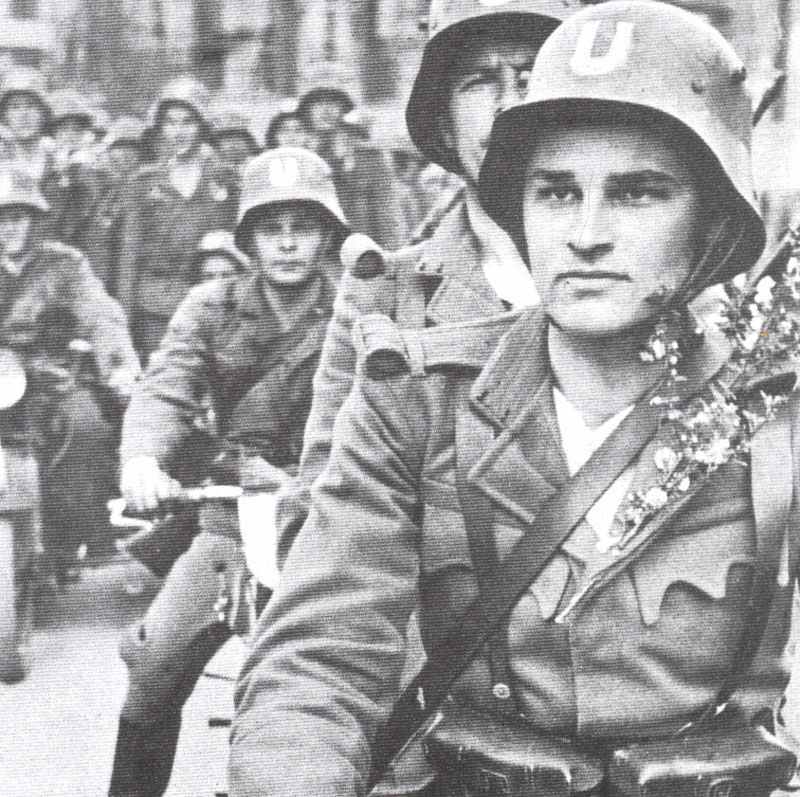 A Italian-Croat Legion was organised as a two-battalion Blackshirt Legion with an artillery battalion attached. It fought well with the Italian 3rd Mobile Division, but was destroyed during the Don retreat. The German-Croat Legion was organised as a three-battalion infantry regiment with an attached artillery battalion, and was known as the ‘369th Reinforced Croat Infantry Regiment’. It was lost at Stalingrad. The Croat para-military organization which fought against both the partisans and the Chetniks was the Ustashi which had both a military and police role. In addition to some of the better organised and disciplined units, there were a number of ‘wild’ bands – mere bandits. By the end of 1941 there were 15 Ustashi battalions, which were combined with Army units to form 16 combined Domobranen-Ustachi divisions and another 30 brigades with a total strength of some 114,000 men with another 38,000 in territorial units. At the end of the war the remnants of these units were gathered together to form one battle-worthy division, the 1st Croatian Storm Division. Bf 109 G-10 of the Croatian squadron surrendered to US Forces at Falconara in Italy, April 1945. Initially the Croatian Air Force was equipped with aircraft from the former Yugoslav Air Force or machines supplied by Italy. In October 1941 a Croatian Air Force Legion was formed consisting of one fighter squadron (Messerschmitt Bf109s) and one bomber squadron (Dornier Do17). Under the premiership of General Milan Nedic, the Serbian area of Yugoslavia was treated as an occupied country but allowed to raise a limited number of armed troops for internal security duties. Gendarmerie-type units which existed during the war were the Serbian City Guard with a total strength of 15,000, the Serbian State Guard (Srpska Drzavna Straza), successor to the Royal Yugoslav Gendarmerie with Danube and Dvina regiments, and the Serbian Frontier Guard (Srpska Granicna Straza). The most overtly collaborationist was the Serbian Volunteer Corps (Srpska Dobrovoljacki Korpus) formed in the spring of 1943. At the end of 1944 the Corps and its German liaison staff were transferred to the Waffen-SS as the Serbian SS Corps and comprised a staff, four regiments each with three battalions and a training battalion.